white with a blue saltire and a red rectangle in the middle. The next flag (#137) in Lloyd's is similar, but with a red saltire and a blue rectangle, as the house flag of "Joseph E. Murrell & Son", also registered in West Hartlepool. 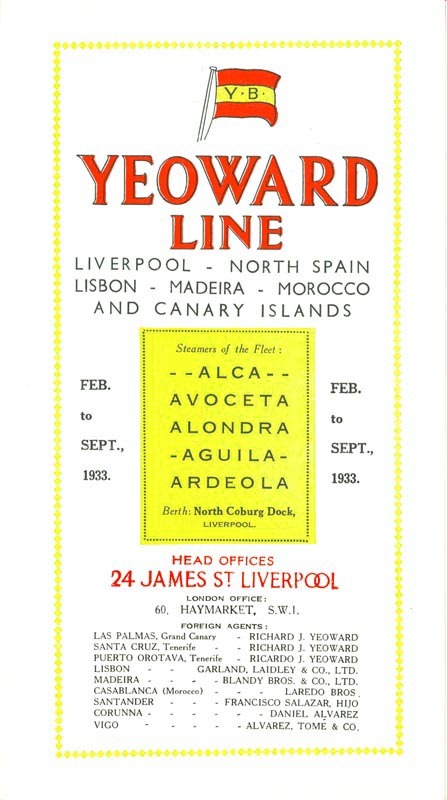 There is indeed a "Murrell and Yeoman" company mentioned in West Hartlepool. The National Maritime Museum in London keeps an enamelled badge (http://collections.rmg.co.uk/collections.html/collectionsDetail.cfm?ID=JEW0300), acquired on a cruise to the Canaries in 1928, decorated with the house flag of the Yeoward Line. It is the badge of SS Avoceta, built in 1923 and sunk by a submarine in 1941. The flag is horizontally divided red-yellow-red, with the letters Y.B. in gold.